Ingredients: Sophora flower , sanguisorba root , red peony root , phellodendron bark , tribulus fruit . Cooling blood, quickening blood circulation, clearing heat. 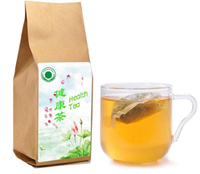 This tea could help reducing hemorrhoids and local bleeding. Ingredients: Astragalus root , picrorhiza root , light wheat grain , glutinous rice root, schisandra berry . Enriching vital energy, stopping sweating. This tea could help too much sweating in the daytime or at night. Ingredients: Dandelion , Chinese Lobelia , bearded scutellaria , hedyotis , astragalus root . Clearing heat, resolving toxin, enriching vital qi. This tea is helpful for preventing all kinds of cancers, or for treating cancers in the early or middle stage. Ingredients: Notopterygium root , kochia fruit , cnidium seed , flavescent sophora root , tribulus fruit . Removing dampness, stopping itching. This tea could help eczema. Ingredients: Tribulus fruit , ledebouriella , kochia fruit , dictamnus root bark , puccoon . Eliminating external wind, relieving itching. This tea could help dry skin with much itching. Ingredients: White peony root , notopterygium root , ledebouriella , dipsacus root , Tangkuei . Eliminating dampness, quickening blood circulation, relieving pains. This tea could help hyperplasia or prolapse of the vertebra. Ingredients: Salvia root , red peony root , carthamus flower, mulberry , lycium berry . Opening blood vessels, strengthening the kidneys. So this tea could help people enjoy longer life.